DC Comics ushers in a new #DCYOU era this month as its flagship book Justice League launches a mega event its been building to for four years: Darkseid War. A conflagration between the Dark God of Apokolips Darkseid and the multiverse's greatest terror the Anti-Monitor over who truly is the Big Bad of the DC Universe - with the heroes of the Justice League caught in the middle. But perhaps the most interesting thing about this story by DC Chief Creative Officer Geoff Johns and probably the hottest artist in DC right now Jason Fabok are the real world ramifications to one iconic DC superhero in particular: Wonder Woman. Wonder Woman has been caught in a puzzle for her entire existence. As just about every other (male) superhero has found gigantic success starring in blockbuster movie franchises, the greatest female superhero of all has struggled to find a movie to star in. In 2016, Gal Gadot will embody the Amazing Amazon in Batman v. Superman: Dawn of Justice, with director Patty Jenkins slated to direct her long-awaited live action solo film. But Wonder Woman continually has issues that boils down to a simple problem: she has no real iconic story to draw from that can be adapted to a live action film. More importantly, Wonder Woman lacks what most of her male peers have: that one iconic villain to challenge her. Batman has the Joker, Captain America has the Red Skull, Thor has Loki, Superman has Lex Luthor. Who does Wonder Woman really have as an opposite number? The Cheetah? Dr. Psycho? Even Ares the Greek god of war falls short in capturing the imagination. Enter Grail. With Grail, I believe Johns and Fabok have at last untied the magic lasso's Gordian knot, finally creating that singular iconic enemy for Wonder Woman. You can read Grail's origin for free right here. In a nutshell, Grail is the daughter of Darkseid and an Amazon, born on Paradise Island just as Princess Diana was born to Hippolyta. In her revised origin, Wonder Woman is now the daughter of Zeus and has become the God of War. 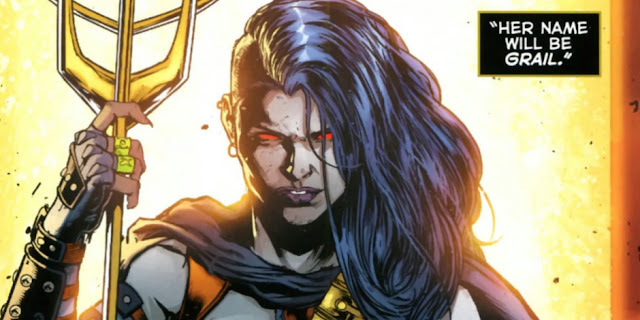 Grail is her fearsome opposite: the daughter of the Dark God of Apokolips. It's a simply elegant creation, and she is gorgeously designed by Fabok as a deadly looking yet still compellingly attractive amalgam of Darkseid's black Omega and her Amazonian heritage. Grail is the Black Adam to Wonder Woman's Shazam, the Venom to her Spider-Man. She is, in many ways, Wonder Woman's Holy Grail. Grail, still brand spanking new, is already just begging to be in a Wonder Woman movie. Or maybe I'm the one who's begging. At the very least, asking politely. I hope there are cinematic ambitions for Johns' and Fabok's wondrous new creation, because in my mind Grail is the key to Wonder Woman's cinematic future. Think about it: the most successful female lead superhero franchise of all time? The Hunger Games. * Who is Katniss Everdeen's greatest enemy? President Snow, a sinister old man. They can never fight, have a throwdown in the grand superhero tradition. But Wonder Woman played by Gal Gadot taking on Grail played by a worthy Hollywood actress (Alexandra Daddario, maybe? She of the luminous blue eyes and who already played a daughter of a god in Percy Jackson...) would be money. You can have my money right now! Meanwhile, I'll just enjoy how Darkseid War unfolds as I dream of Wonder Woman and Grail battling it out on the big screen. * Yes, I think Katniss counts as a superhero.